The HR landscape is no longer just about the softer aspects of managing people, instead it leverages the latest technology in order to add value to a business. These technology advancements have made a huge dent in the HR domain, and experts are now seeing the market flooded with an excess amount of HR software solutions for various talent engagements. Goodhire serves as a “legal lookout” for a company, especially by way of ensuring that only the right candidates with the best possible and relevant background are hired. It does so by offering background check features through a digital channel, therefore helping lower the risk of costly legal suits brought on by bad hires. Crelate is a modern, fast, full-featured applicant tracking and talent relationship management solution built specifically for Recruiting Agencies, Executive Search and Staffing Firms as well as professional corporate recruiters teams. Features include Outlook client integration, automatic email tracking, flexible workflows, candidate portal, mobile access, client submittals and more. LinkedIn has become an extremely popular social media platform for recruiting talent and potential job candidates. However, only a few are aware of the immense capabilities it offers, both for job seekers and for recruiters. The success of LinkedIn is attached to its rich database that offers real-time talent insights. The great thing about LinkedIn is that it’s not just for recruiters. The wealth of information in its articles and post shares makes it an excellent place to stay ahead and in check with all the latest HR trends and industry updates. Kudos is a corporate social network and peer-to-peer recognition system designed to engage your teams with enhanced communication, collaboration, appreciation, and recognition. Kudos is simple, scalable, flexible, effective and affordable. ADP is one of the largest HR and Talent Management software vendors in the US, offering talent acquisition solutions to HR professionals. The company has a host of offerings from payroll to statutory compliance, to leave management and time and attendance – a number of which are cloud-based. Its Human Capital Management (HCM) solution is end-to-end software for enterprises. Slack is an increasingly popular and efficient enterprise messaging platform that’s used for collaboration and communication at the workplace. This, in turn, is able to drive HR effectiveness. Slack has a number of team-management features, conference calling, direct messaging, document sharing, one-on-one chat rooms and team meetings. Compatibility with other applications such as Dropbox and Google Drive makes this tool easy and convenient to use. It’s a good time for HR professionals and managers to take the leap from manual to automated, if they haven’t already done so. Automation technology open up new avenues and opportunities for HR work by reducing the burden of strategic HR activities and freeing up your bandwidth to focus on value-adding work. Adopting HR and talent management software (TMS) is a sure way to keep everyone in the company happier and more productive. Looking for more? 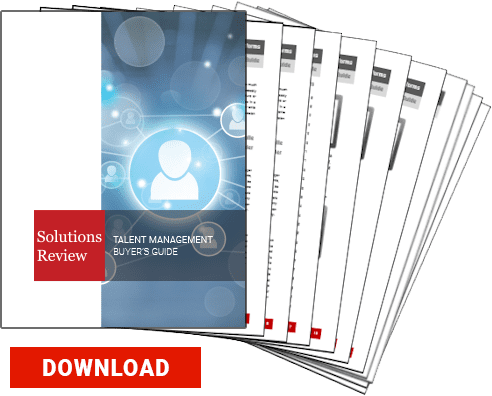 Download our all new free buyers guide and check out the top Talent Management software vendors, along with snippets of their highest ranking products and solutions, plus the top 10 questions and tips about the implementation and selection process!